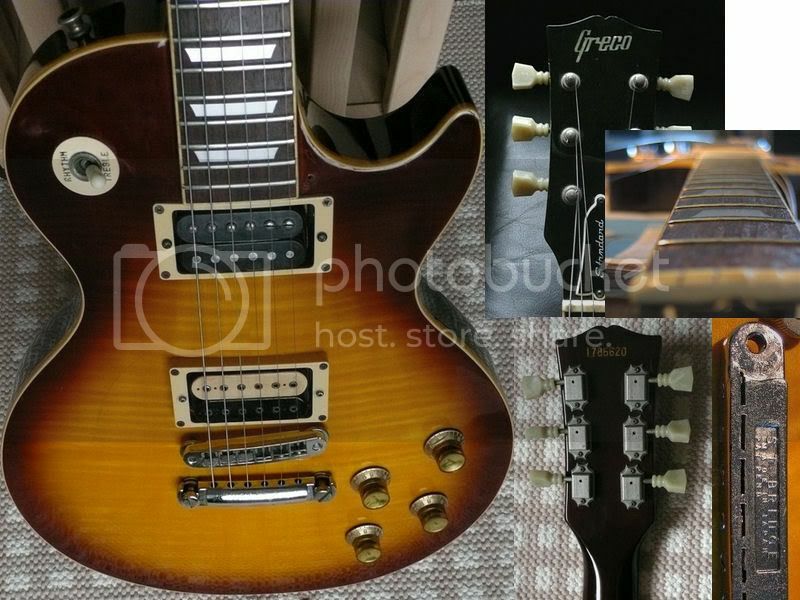 There's a 1978 Greco Les Paul for sale on a finnish auction site. Never seen anything like it before, it's not a Super Real. The price is now little over 200 ? and there are lot's of bidders. The auction closes 25th february so I could image it will sell for maybe 500? or so. I think I'll pass myself. The seller says the body is hollow. Can this be true? Is this a real lawsuit model? Yes most Greco before 80 copy the Gibson of the 70's with chambered bodies. As 20th Century Boy said the Lawsuit is complete marketing BS. Gibson didn't like the Ibanez Gibson copies showing up for sale in the USA with Gibson open book headstock shapes. Gibson will try to sue if a company uses it's headstock shapes, especially if the guitars end up for sale in the USA. The so called Lawsuit applied only to Ibanez guitars intended for sale outside of Japan and never got to court. It was settled outside of the courts as Ibanez had already changed their headstock shape. You make it sound as if the G*bsons of the seventies where chambered, which of course isn't the case. Chambered, by the way, makes me think of somthing which has been removed on purpouse. Like on the "new" wheight relieved G*bsons. Since the void in the seventies LP-copies is not on purpose, I would prefer to call it hollow. Instead of carving the top out of solid maple the top is made of plywood which is pressed into shape during heat and steam treatment. The exact same way G*bson makes the top and back for their 335 by the way. Only their plywood seems more expensive.. The hollow LP's sound's nice, not like the solid ones though, they are usually louder unplugged for instance. Most people who started out with a hollow find it cumbersome when they finally can afford the real thing and "the sound" isn't there anymore. Nice guitars if you have the balls to judge it from its own qualifications. i have 1 of these ply-top lp's (aria pro2 ls 400), and DNS speaks the truth, they really sound great. with proper pu's !